Taking your child to the dentist for the first time is a momentous occasion. In addition to ensuring your child has optimal oral health, there are other benefits of taking your child to the dentist at a young age, and in today’s blog, we’ll review a few reasons why early dental care is important for children. 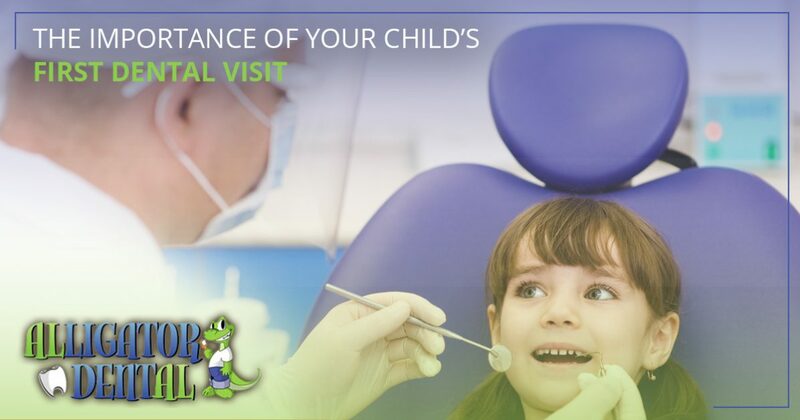 If you’re looking for a reputable pediatric dentist in San Marcos, contact Alligator Dental. We offer teeth cleanings, emergency care, and more for children of all ages, and we would love to meet your family. Call us at 512-393-3500 today to learn more! The development of good oral hygiene habits is essential to your child’s overall health, and taking him or her to the dentist at an early age is always a good place to start. Below, we’ve listed a few benefits to early routine dental visits. For kids, the idea of meeting new people is scary, especially if those people are wearing masks and using tools that make strange noises. It can be tempting to put off your child’s first dental visit to spare him or her from the possible anxiety that new people in an unfamiliar environment may cause, however, the sooner that your child has his or her first appointment, the less stressful future visits will be. Making the first appointment between six and 12 months allows your child to become familiar with activities such as oral exams, teeth cleanings, and fluoride treatments. A large part of the dental anxiety children experience may be caused by them not knowing what to expect when they visit the dentist. Additionally, they may have overheard their friends, siblings, or parents talk about their recent trip to the dentist. As your child becomes better acquainted with the dentist office, staff members, and equipment, he or she will know better what to expect from future visits, and this can do a lot to dispel any lack of trust that he or she has in the dentist. As the old saying goes, “an ounce of prevention is worth a pound of cure,” and this is certainly true when it comes to your child’s oral health. One of the primary benefits to taking your child to the dentist when he or she is young is that the potential for early detection of possible dental concerns. The dentist will complete a thorough examination of your child’s mouth, taking care to note any signs of decay, improper development, and other abnormalities. Early detection of pediatric dental issues is essential for proper monitoring and corrective treatments as your child grows older. As a parent, you likely do everything that you can to help your children start and maintain healthy oral hygiene habits. However, it never hurts to have the assistance of a professional when you’re helping your child learn how to properly care for and maintain their beautiful smile. A skilled pediatric dentist will know how to best explain conditions like cavities, canker sores, and toothaches in terminology that catered to your child’s age. These explanations and expert instruction is essential for establishing sound oral hygiene habits early to provide a strong foundation for your growing child. Parent guidance and oversight is incredibly important to a child’s oral health, and scheduling your child’s first dental exam when he or she is young can prove very beneficial for parents, as well. When you attend your child’s appointment, the dentist will provide information and education to you so that you can help your child care for his or her teeth. 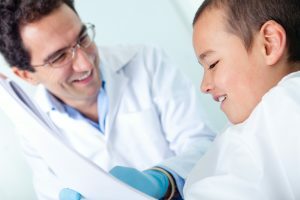 The dentist may show you proper brushing and flossing techniques, discuss diet and habits that can affect the development of teeth, and provide tips on how you can encourage your child to make oral hygiene a priority. Staff introduction and tour: your new dentist should take the time to introduce you to the staff and take you on a tour of the facility to make you feel more comfortable during your appointment. Exam and cleaning: the dentist will perform an exam and teeth cleaning while you are there, and he or she may also choose to take x-rays of your child’s mouth to document any concerns or existing conditions. Discussion and questions: once the exam, cleaning, and x-rays are complete, the dentists will take the time to discuss his or her findings. During this time, he or she may provide tips or advice, and should take the time to answer any questions you have. Is it time for your child’s next teeth cleaning? The staff at Alligator Dental makes going to the dentist fun! From the bubble wall and televisions to the fun exam area, your child will love our office from the moment he or she first enters. Contact our team today to schedule an appointment for your child with one of our pediatric dentists in San Marcos!